Now that MilkyWay@home Separation Modfit has been running for a year as a stable application, we are going to be releasing it as the official MilkyWay@home application under our main project. This means we will slowly (over the next month) be phasing out the dedicated Modfit project as it will be redundant. Additionally, this means some extremely old systems may no longer be supported on the MilkyWay@home project. These include Windows 32-bit systems, and very old (CAL) GPUs. If you are noticing compatibility issues with your system after we begin the change next week please post them here. Modfit is now up and running on the main application. If you are seeing any issues please let me know here. For instructions on compiling 32-bit MilkyWay@home, please visit http://milkyway.cs.rpi.edu/milkyway/forum_thread.php?id=3957. If you do still want to crunch for the project in the future, we do have 32-bit linux support. I understand asking for you to change you operating system may be a stretch, but it is the best solution we can offer at this time. Thank you for seven years of support. Host 691866 is a 64 bit Ubuntu 15.10 linux client running boinc 7.6.6 and every single new task is terminating with an error. It was previously running thousands just fine. Edit: The gpu tasks (opencl_amd_ati) are generating the errors. Not sure about the cpu tasks yet. Second edit: Looked back in the logs and yes, CPU tasks of the same type are all terminating with errors as well. Looks like it didn't recognize my deprecation of the old applications. I gave everything a quick reboot. That usually fixes things. I will keep an eye on everything for a little while though. Message 64694 - Posted: 20 Jun 2016, 18:25:48 UTC - in response to Message 64693. This machine is doing a few projects, but MW@H should come up in the rotation shortly. I'll let you know if all is well. Yep, that fixed it. Thank you, Jake. "Additionally, this means some extremely old systems may no longer be supported on the MilkyWay@home project. These include Windows 32-bit systems"
My XP machine has kissed the project goodbye, but I have an AMD64 machine running Win10 with a GT-730 still getting tasks. But -- I have it setup to run muntiple WUs (2, actually) at a time and I need to get the new executable as all milkey@home WUs are ending in error now. Modified fit tasks running OK -- can I use the same executable that is running those? Message 64701 - Posted: 21 Jun 2016, 6:48:22 UTC - in response to Message 64678. Just to clarify, what is the name of the new task, in the Boinc Projects directory? I am getting computation errors since yesterday, but i think it has to do with the PrimeGrid apps i am running since then. My PPC Mac is now being refused tasks and the PPC app's no longer mentioned on the site's Applications page. My Intel Mac is receiving the new tasks even though my MilkyWay@Home preferences are set not to be sent Modified Fit or N-body tasks under any circumstances. The three results which have been reported so far have received inconclusive validations. My Tasks page shows that my PPC Mac was also sent one of the new tasks yesterday but errored out on it immediately. A Linux machine had previously errored out on the same task and another received a validate error. I am going to try to answer all questions here in this post. Scan through until you see your name and answer. Power PC Macs will also no longer be supported under the new program. This is a similar position with the Windows 32 bit application where we simply do not have the ability to develop and test for these systems anymore. You can always compile your own 32-bit Windows application. I actually forgot to mention this in the news post so I will add this as an edit there too. I will try to write up instructions on how to do this on the Number Crunching forums a little later. Also the Modfit and MilkyWay@home applications are now the same so yes you can use the same executable. Well first of all think about your question for a minute. Of course we don't want our volunteers running away from our project! We love you guys (well most of you, rarely one of you can be pretty mean) and without you all, this project could not function. Yes, as of yesterday Modfit is now being run on the official MilkyWay@home application as it is now the officially supported application. Only expect to see Modfit work units going forward. Thank you all for your patience and understanding as we migrate over to Modfit for the whole project. If you have any more questions keep posting them here and I will try my best to answer them. Message 64708 - Posted: 21 Jun 2016, 14:37:55 UTC - in response to Message 64702. One of the reasons I originally set my preferences against these tasks — apart from their higher-than-acceptable tendency at the time not to get validated — was the miserly credit awarded when they were validated. It's too early to say anything about current validation rates, but a couple of the above-mentioned tasks have now validated and the miserliness is even more extreme than I remembered! The old MW@H tasks took around 4,800 seconds of CPU time on my Intel Mac and earned 106.88 points apiece. These new ones are taking nearly twice as long and earning only a quarter of the credit. While I don't support BOINC projects for the credit, this does feel a bit like the proverbial slap round the face with a wet kipper. Okay these work units should run much faster than the old work units because they are using far fewer integral steps than the previous version of MilkyWay@home. This should equate to a 4 times speed up. I'm not sure why your taking much longer to run work units from Modfit. The credit calculation should be about correct (I can tweak it a bit in the future as we see how long these runs are taking comparatively to the old runs). ATI sleeps more like running. The tasks can not be made any longer at this time without adding essentially useless calculations to the workunits. (They would run longer but not change the science.) To get around this problem we suggest configuring BOINC to allow you to run multiple GPU work units at a time. Also you are allowed to download something like 150 work units every minute. Not sure how you are running out of work to do. 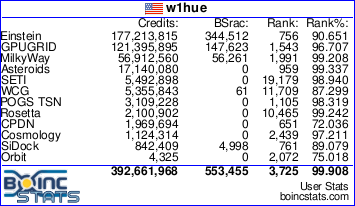 Maybe check your BOINC network settings to see if you can ask for work more often. I'm running into the same problem as Nigel Garvey - tasks take twice as long and the credit earned is a fourth of what it used to be. I don't know if it is some sort of artifact of running Macs or something else. I have core 2 duos, and i5 computers running OS X from Snow Leopard to El Capitan. I am curious as to what is going on. Message 64715 - Posted: 21 Jun 2016, 17:57:48 UTC - in response to Message 64712. Also you are allowed to download something like 150 work units every minute.